Glass Etc. is one of Britain’s largest shops selling antique and 20th century glass. Run by Helen & Andy McConnell, the principal shop, housed within a former Salvation Army chapel, measures 100 square metres, with an adjacent exhibition gallery of about 25 square metres. Our stock is vast, though not all on view. Drawing on Andy’s collection of around 30,000 pieces, we attempt to cover the span between c1750-1980. Helen & Andy sell [and buy] most forms of glassware, ranging from decanters and wine-glasses through vases and scent bottles to sculptural suncatchers and chandeliers. We also stock a wide range of architectural ironmongery, including door and window furniture, cabinet knobs, stained glass panels, etc. The ’Etc’ in our name covers all manner of other forms of antique and vintage furniture and furnishings; from old kitchen scales and blue & white banded Chefware crockery to mirrors and coffee tables. These Study Days can be delivered either home or away. Home is wherever an audience can be gathered, or here in Rye, our beautiful ancient town on the Sussex Coast. 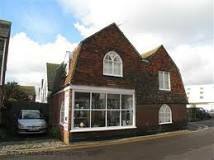 At Rye, we use the Fish Cafe, the town’s best restaurant, just a two minute walk from Glass Etc. We use their spacious, well-lit function room and enjoy either their excellent ‘finger buffet’, currently priced @ £9 per head, or a two-course slap-up meal for a fixed fee Linen-set tables are laid on for both options.